Once assessed by 'Gardening from Which?' 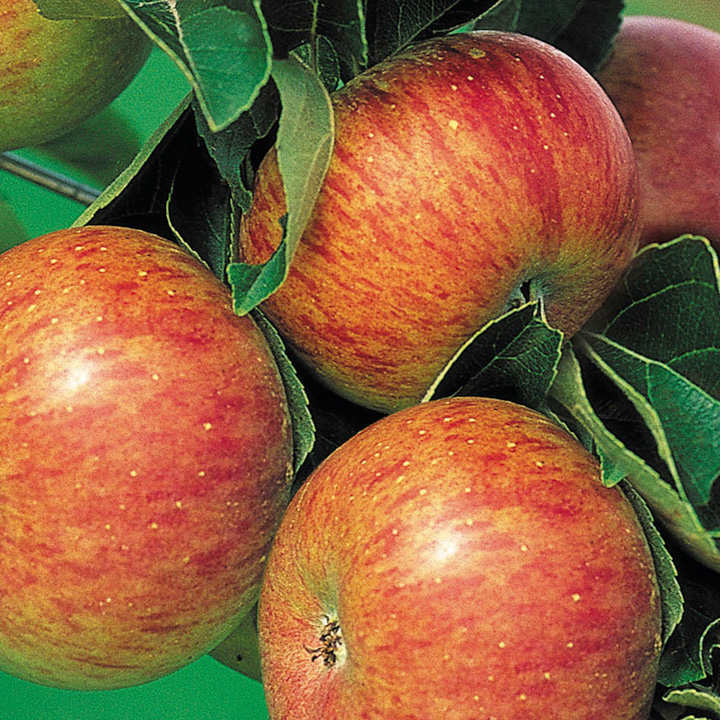 as the best all-round British garden apple, this is indeed a superb mid-season variety. The crisp, firm fruits are bursting with sweet juice! Ready to pick from September, they will keep well until Christmas! Pollination group 2. (SF - self-fertile). 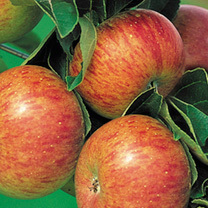 Our apples are grafted onto an M26 rootstock which produces an easy-to-control semi-dwarf tree with medium vigour. Height 3m after 10 years. The best all-round British apple! Apple cultivation can be adapted to a wide range of growing styles depending on space and individual preference. Here we describe the more classic styles together with some exciting modern innovations which enable a heavy crop of fruit to be grown in the smallest of spaces (our trees are grafted onto rootstocks which keep them at an ideal garden size). A number of these styles can also be used for other fruit crops. CRAB APPLES - These can be grown following instructions for apples and are best grown as an ‘open centred’ tree. Crab apples tend to become quite spindly if left to their own devices. To encourage stronger growth we recommend reducing branches by about one third every other year whilst dormant. This has the additional benefit of improving fruit size and health. BUSH - Probably the most widely seen style of apple and, well grown, can be a highly productive method. The aim is to arrive at an open centred tree with a maximum of six main branches which form the ‘backbone’ of the tree for life. Sub branches of these will bear most of the fruit and these are removed, allowing replacements to grow, as they reach about four years old. This will maintain the bulk of the tree in a ‘young’ state to ensure maximum productivity. Bush trees can be planted about 3–3.5m (10–12') apart. Once planted the central leader (main stem) should be removed at a point just above the highest side branch or feather. This will encourage the feathers to develop and the strongest and best placed ones should be selected as the main frame of the tree. Over the next three seasons all that is needed is to cut these back by about one third in winter to encourage sub branch development. When, from year 4, older sub branches are removed make sure that the cut is made at a union with another as this will maintain a healthy productive branch structure. Aim to limit the height of the tree to around 2.4m (8'). and expect your tree to be yielding up to 22kg (50lb) of fruit once it reaches 5 yr.